Here are some common questions and answers about secondhand smoke also known as environmental tobacco smoke (ETS). A: Secondhand smoke is a mixture of the smoke given off by the burning end of a cigarette, pipe or cigar, and the smoke exhaled from the lungs of smokers. This mixture contains more than 4,000 substances, more than 40 of which are known to cause cancer in humans or animals and many of which are strong irritants. 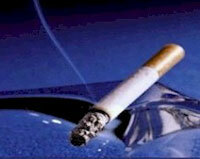 Exposure to secondhand smoke is called involuntary smoking, or passive smoking. Q: How does secondhand smoke affect my health? A: Secondhand smoke has been classified by the U.S. Environmental Protec-tion Agency (EPA) as a known cause of lung cancer in humans (Group A carcinogen). EPA estimates that ETS causes approximately 3,000 lung cancer deaths in nonsmokers each year. Q: What about the risks to children? A: Secondhand smoke is a serious health risk to children. EPA estimates that passive smoking is responsible for between 150,000 and 300,000 lower respira-tory tract infections in infants and children under 18 months of age annually, resulting in between 7,500 and 15,000 hospitalizations each year. Children exposed to secondhand smoke are also more likely to have reduced lung function and symptoms of respiratory irritation like cough, excess phlegm, and wheeze. Passive smoking can lead to buildup of fluid in the middle ear, the most common cause of hospitalization of children for an operation. Asthmatic children are especially at risk. EPA estimates that exposure to secondhand smoke increases the number of episodes and severity of symptoms in hundreds of thou-sands of asthmatic children. EPA estimates that between 200,000 and 1,000,000 asthmatic children have their condition made worse by exposure to secondhand smoke. Passive smoking may also cause thousands of non-asthmatic children to develop the condition each year. Q: What can I do to reduce my family's risk from ETS? A: Do not smoke in your home or permit others to do so. If a family member insists on smoking indoors, increase ventilation in the area where smoking takes place. Open windows or use exhaust fans. Do not smoke if children are present, especially infants and toddlers. They are particularly susceptible to the effects of passive smoking.